Fans of the NBC sitcom Community are familiar with the show’s catchprase/goal of “Six Seasons and a Movie.” The series is currently in its fifth season — which is worlds better than last year due to the return of its creator Dan Harmon — but it doesn’t seem like an actual Community film will ever get made. 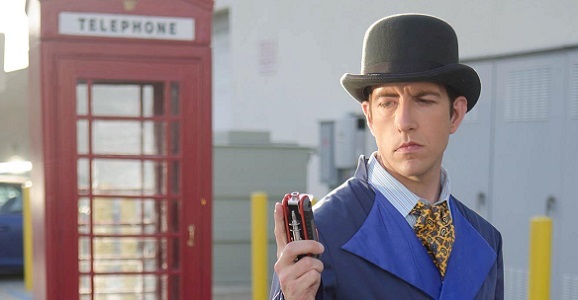 But if they changed that to “Six Seasons and a Spinoff,” it might make more sense, as the popular Doctor Who-spoofing Inspector Spacetime (Travis Richey) is getting his own movie! And it will feature appearances from the Seventh Doctor himself, Sylvester McCoy, as well as Star Trek alums Robert Picardo and Chase Masterson, and The Big Bang Theory‘s Mayim Bialik. I don’t see how this movie can get made without Danny Pudi getting involved, so make this happen, Internet! While the producers (including former Marvel development director Golan Ramras) ran an unsuccessful Kickstarter campaign last year to try and raise funding for a second season of their Untitled Web Series About a Space Traveler Who Can Also Travel Through Time, they’re headed back to crowdfunding with IndieGogo to get the pre-production off the ground for what is now being called Untitled Motion Picture About a Space Traveler Who Can Also Travel Through Time. Those interested can donate money here. The switch to a feature was made once the awesome guest stars all signed on, and the producers figured that they could probably attract bigger investors with a film rather than a web series. Smart guys. Untitled Motion Picture will be directed by Nicholas Acosta, whose work can be seen in the second season’s prequel below. Richey will once again don the hat and trenchcoat as the non-Inspector, with his compa…er…mate Piper Tate once again played by Carrie Keranen, and Eric Loya reprising his role as Boyish. McCoy will star as the enigmatic Uncle Roderick, while Picardo will be playing the family physician Bernard, who has his own mysterious identity to worry about. Masterson takes on the role of Annabelle, a nice woman with a darker side. Bialik seems to be the only actor not playing a secretive role, as she’ll be voicing the B.O.O.T.H., the Inspector’s sentient non-TARDIS time machine. Now check out that prequel episode. For those interested in hearing what McCoy had to say about joining the cast, check out his amusing reaction video below. This being an indie movie working with crowdfunding, there’s no telling when production would actually begin, but stay tuned. Maybe the Inspector will stop by your house to let you know.